Mayor Boris Johnson has agreed to meet residents fighting a proposal for an eight-storey ‘gated community’ on Kingsland Road just north of Dalston Junction railway station. The plans run contrary to council guidelines of four to six storeys for the site, which is owned by Transport for London (TfL) and located directly above Dalston Junction’s reinstated train tunnels. Mayor Johnson committed to meet campaigners after local resident and Conservative London Assembly member, Andrew Boff, urged that previous “crazy schemes” in the area were not repeated. As well as enclosing and reducing light to listed buildings to below British standards, the development will have minimal affordable housing and no public green space in an area of London that is in need of both, according to the campaign group OPEN Dalston. The group’s founder, Bill Parry-Davies, has queried the benefit to the public of proposals in light of TfL’s status as a public body that acquired the sites at the public’s expense. He has also pointed out that TfL received a subsidy from Hackney Council for the development of over £1.3million. Although the council’s costs are recoverable as part of an agreement with TfL, the amount and terms on which funds were committed are now subject to a Freedom of Information request submitted by OPEN. Mr Parry-Davies said the proposal for a major gated community in Dalston is unprecedented and that “for TfL and Hackney to spend public money on a private development with so little public benefit is a slap in the face for Dalston”. With over 12,000 people on Hackney’s housing waiting list and rents rocketing, Mr Parry-Davies said the proposal needed to be looked at considering Dalston’s “desperate shortage of family housing”, the area’s “severe deficiency of green and open space” and the “environmental damage to heritage buildings and local character”. Hackney Council said they have no specific policy which addresses gated developments but that they seek to resist them through building “high quality, accessible developments”. TfL described OPEN’s statement that the intended development “created a barrier between a private development and the remainder of Dalston” as inaccurate. 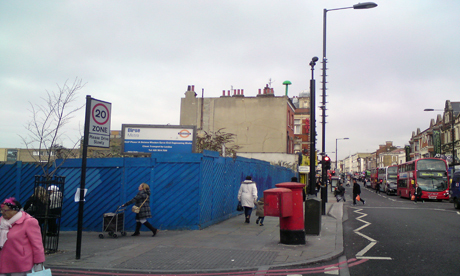 TfL admitted that their open space proposals were not compliant with the council’s Area Action Plan (AAP) for Dalston – despite the council’s design guidance for the site encouraging such uses. The Dalston AAP also contains the recommendation for a development of four to six storeys within the proposed site. The plan is described by the council as existing to “provide confidence and certainty to developers”. However, TfL’s development partners, Taylor Wimpey, said such parameters “are set without the benefit of seeing a detailed design and supporting technical correspondence in the form of a planning application, and are open to analysis and testing”. The eight-storey development would contain 59 flats and the planning application shows that, across two sites, less than 10 per cent of flats meet requirements for affordable social rent. OPEN Dalston claimed this figure is at odds with the affordable housing policy target of 50 per cent set by Hackney Council and the GLA (Greater London Authority) of which TfL is an agency. Meanwhile, developers Taylor Wimpey cite the GLA London Plan which states that 11,600 new homes are required in the Hackney Borough by 2021. They also quote the plan’s identification of Dalston as an ‘Area for Intensification’, and say their proposals will alleviate housing stress in Hackney through increased residential supply. Ciaran Munnelly, a barman and resident of The Kingsland pub adjacent to the proposed development site, said that under the current plans “they might as well demolish [these buildings] and make it one big block”. The Kingsland forms part of a terrace dating back to 1902 that includes several Grade II listed buildings. “When they say about green space – that should be there now, for the people of Hackney from this area. But there’s nothing here – what green area is there?” said Mr Munnelly. Nobby Clarke, a retired Dalston resident of 35 years, said he was “totally against” the proposals because the council only wanted revenue and “don’t give a crap about the man in the street’s arguments”. “If the council want it, it’ll go through,” he added. However, Salma Said, who runs the Snappy Snaps photographic shop situated closest to any future development at the end of the terrace disagreed, saying: “I don’t see it as a threat. Any building that brings people to the area, especially business, is a good thing. Hackney Council’s public consultation, which was due to close on 20 December, has now been extended to 6 February – the date of the next Planning Committee hearing.